The last part of my work consisted in developing some export function. The first one is the function ascollada. It works only with MULTIPOLYGONS, TIN and POLYHEDRALSURFACE. 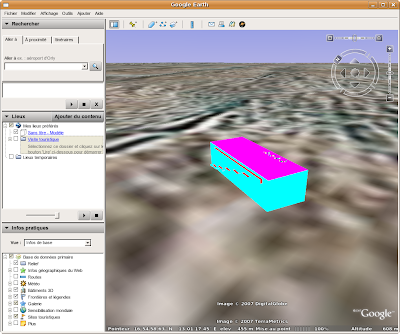 I also developed a command named pgsql2kmz which create GoogleEarth models with geometries providing from PostGIS. Specify the altitude of the camera at the beginning. Export the geometries in kml format which doesn't support textures. all geometries in GoogleEarth. Must be used only with -kml option. (the default one) with -kmz option. 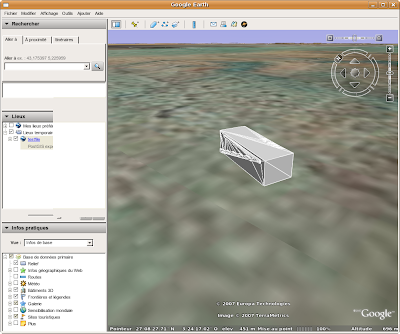 So it's possible to create a 3D model for Google Earth in collada or kml format and to store it in a kmz archive. 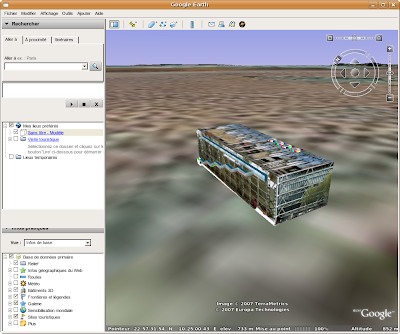 KML doesn't support informations about textures instead of collada, so if you export a model in kml, you'll see it in gray with the GoogleEarth browser. If you decide to export it in collada (default mode) without informations about textures, the browser will choose a random color for any face of your model. The geometries which are exported are the geometries we imported with collada2pgsl (pompidou.dae). 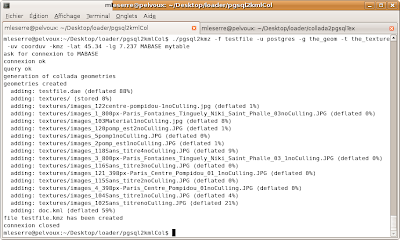 The kml export use the native function askml() of PostGIS. 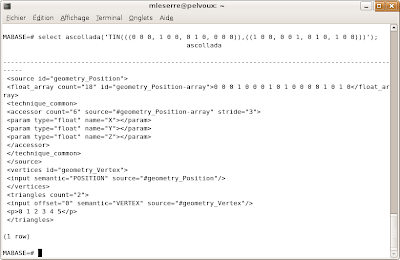 So, the geometry you want to export must have a SRID. The -c option is really important if you do kml export because it concatenates all geometries and allows to see the full model in GoogleEarth. If you add -kmz option, the kml file will be stored in a kmz archive but the result will be the same. If you add the -kmz option, the result will be the same, but the collada file will be contained in a kmz archive. I am graduate student from Shibaura Institute of Technology. My research is to syncronize 3D GIS data into game engine. Since I have to query 3D data from PostGIS (I use GrassGIS) into Blender, your script (PGSQL2KMZ) it seem very useful to study. By any possibility, could you give me the link so I could download the script?